Congrats to a worthy winner in China's Li Chao. The top five qualify for the World Cup and because Barbosa had already qualified, the top six above are effectively all in! For the women it was just one place and second seeded Huang Qian took the only qualifying slot on tiebreak ahead of top seeded Chinese compatriot Tan Zongqi. 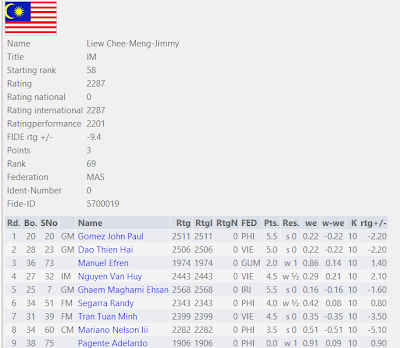 Malaysia was represented by IM Jimmy Liew (no woman player was interested) and given he also attended the FIDE Trainer Seminar held concurrently, I think a 9-10 point rating loss could even be considered to be a success in such an incredibly strong field! No doubt he will be telling his reader all about his adventure in his blog in the days to come but the table above would indicate that Jimmy is still too strong for those lower rated than him, that on his day he can hold stronger IMs but those with the GM title are now a little beyond him. And we must end here by congratulating Jimmy on now also achieving the FIDE Trainer title, joining Mas and Mok who in the last year have also done so, and so that now makes four of us and MCF's job a little easier in introducing a national coaching panel.